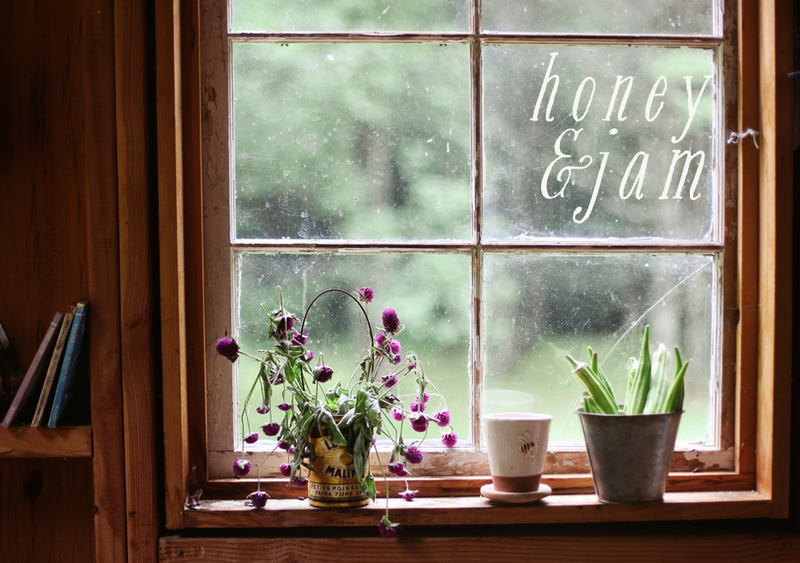 honey & jam | recipes + photos: happy birthday, honey & jam. happy birthday, honey & jam. One year ago today, I was sitting at my dining room table with my laptop, a cup of tea, and a piece of toast and it was there I decided to start a blog. You see, I knew only a little bit of about the blogging world, and even less about the food blogging world, but it seemed like fun, an outlet for my passions. I had no idea what I was going to do with it, I didn’t even start with a food blog in mind. I’ve grown and learned so much through this blog, as a baker and as a photographer. When I started, I’d sort of given up on photography, due to frustrations with my digital camera. I’d always worked with film before, and the transition over to digital wasn’t an easy one for me. I didn’t understand a thing about lighting, and all the buttons on the back of the camera just baffled me. I picked it back up for this blog, and I’ve learned so, so much this past year. I now have a passion for food photography that is sometimes overwhelming, but so much fun! And of course, I’ve learned so much about baking. Food blogs are such a wealth of information and inspiration. I’ve grown to love the food blogging community, which lends so much support for everyone involved. What keeps coming to mind is thankfulness - I’m so thankful for this little piece of the internet I call my own, so thankful for all of you that read what I write, look at my photos and leave me the most thoughtful comments. Seriously, y’all bowl me over with your kindness. Of course, I have to thank my wonderful family, who puts up with all my shenanigans. To my mother - who supports me no matter what, tolerates my craziness in the kitchen, and laughs with me when things go wrong (which is pretty regularly). To my father - who can build me absolutely anything I ask him to, and supports me in the most subtle ways. To my brother - who always keeps me laughing. And to my sister - my tireless photography assistant and sous chef, I couldn’t do it without you! 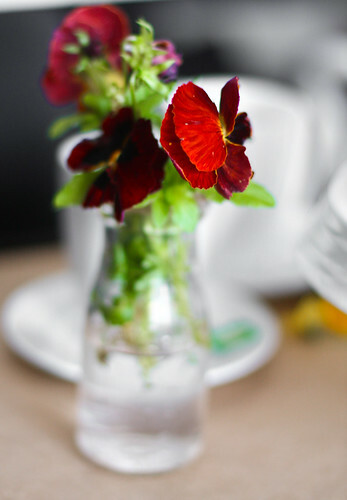 I do believe that’s all I have to say, so today, to celebrate, I bring you what I love - a cup of tea, with honey and a slice of cake, with jam, topped off with cute little edible violas. I hope you enjoy! This is one of my absolute favorite layer cake recipes, and it perfect for cupcakes too. You can fill it with anything, curd, frosting, or my favorite, raspberry jam. And the frosting, it’s so simple, but rich and delicious. Bake for 32-36 minutes, or until a cake tester comes out clean. In a large mixing bowl, cream butter until light and fluffy. Alternate beating in confectioners’ sugar and cocoa, adding milk as needed, until it reaches spreading consistency. Add vanilla. Happy Birthday! I would love a slice of your cake, looks delish. Hooray! Happy blog birthday. Your photos and recipes are beautiful and this cake looks incredible. Very fitting for a celebration. Happy birthday! I just recently found your blog and am really enjoying it greatly. Beautiful stuff! Happy (blog) Birthday! Can't believe you've only been at this madness for a year. And THANKS for the chocolate frosting recipe... I was in desperate need of one! yay and we are so glad you have this blog, Hannah! Thanks for all your perspective and great recipes! HAPPY birthday Happy birthday happy happy birthday to you! woo woo! congrats hannah on such a beautiful and inspiring blog. 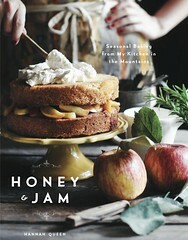 Both your photography and recipes just keep getting better and better and I've enjoyed watching Honey and Jam unfold. Keep up the amazing work and thank you for all of the love, sugar, and flour that you have put into all of your delightful dishes. 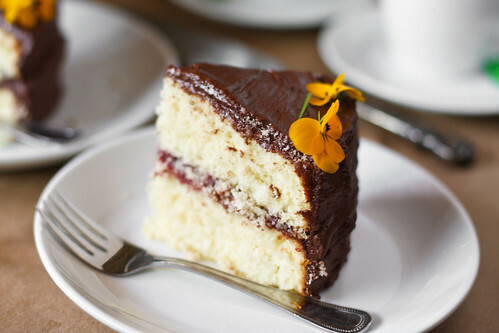 How I would love a piece of this rich yet fluffy cake right now washed down with a big glass of milk. Your photos are remarkably tempting. congratulations on your accomplishment! i have just recently started reading and i love your blog! Happy birthday, Honey & Jam!! I am so glad to have gotten to know you, Hannah, through this little piece of the Internet. If you ever come to Chicago, we are so hanging out. Congrats on the anniversary/birthday! 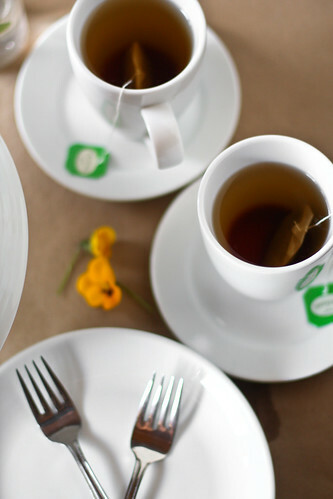 I love your blog, your beautiful photos, delicious recipes, and sweet nature. Every time I read, I smile. Keep it up and use those talents. What a beautiful post!! Its inspiring to hear that you struggled with your digital photography because your photos are so gorgeous now. Happy blog birthday. I must tell you that you are about my favorite blogger. I can always count on your posts being interesting and to see beautiful photography. Congratulations on a full year of posting! I really like your profile pic, btw. Happy Blog Birthday! Beautiful Cake. It looks perfect. no finer birthday cake! looks moist and oh-so-tempting! love the flowers, too -- nice touch. you've got a great thing going here with honey & jam. happy blog birthday! You are one of the most talented photographers. I'm so lucky to have found your blog and I always look forward to your posts. Some of the moments you capture on camera makes me excited and puts a smile on my face. I especially love your nature shots. awesome Hannah. You have some talent, keep it up, we love reading and drooling over your blog! 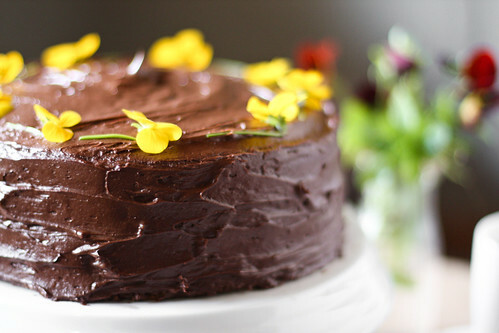 congratulations on the first birthday of one of the best food blogs there is! Happy Blog Birthday to you! Its a fabulous blog! I just celebrated my blogs bday yesterday but my blog has gone no where. Congrats to you and your beautiful work! I love that picture of the pansies. Happiest of birthdays, honey & jam, and many happy returns of the day! Happy Birthday! Here's hoping this next year is even better for Honey & Jam. Happy Birthday blog! 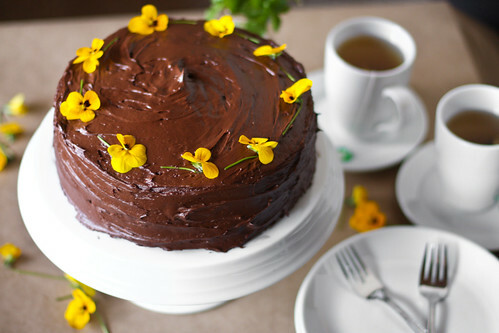 Lovely cake, I love the yellow flowers on top. I am so glad you decided to start a blog. Your food and photography look proffesional. Happy Birthday to your blog and keep up with the great work! That cake looks fantastic and so do your pics! This cake is so lovely! Happy birthday, Honey and Jam! Happy Blog Birthday Honey and Jam and Hannah! We are so lucky you grace the world with your talent. Cheers to many many more years. Happy Birthday to Honey & Jam. I loved reading your grateful comments and those photos of the cake are beautiful. The cake looks awesome. Thanks for sharing. Happy Happy blogbirthday! It takes a certain "stick to it-ness" to have a blog. Keep going, and enjoy. happy one year blog/birthday. such a lovely cake. Happy Birthday Honey and Jam. 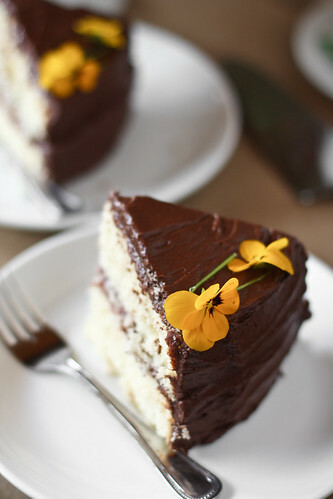 I really enjoyed your blog, your baking and photography. You are a pure talent. Cheers! I am a fairly new reader (you're the first food blog in my bloglines! ), and really enjoy your blog. Happy Blogaversary! Yayness! I remember when I first started following your blog and how quickly it went from an amateur looking blog to the beautiful and amazing resource that it now is. what a touching post. Happy blog birthday. I adore your blog. Happy one year Birthday! Your cake looks and sounds delicious! happy birthday honey & jam! Hannah, these photos are love-love-lovely! it's been great watching you elvolve over the year! you are one talented girl! Happy blogeversary! I always love your photography and that cake looks delish! so beautiful! What camera do u use? Happy Birthday! This is my first visit to your lovely blog and will certainly not be my last! Your photography (and receipes) are beautiful and inspiring. 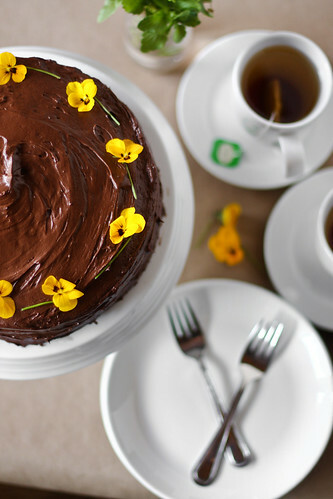 Your lovely photo of that divine chocolate cake with its' yellow flowers makes me want to go right to my kitchen and make it! Congrats on the anniversary! Your photos are gorgeous, and your food looks soooo good. I'd love to come right over for a slice of that cake! Happy Blogaversary! May this year be the best yet ever! Your photographs are stunning - what a revelation to me about your photography skills.. keep up the good work. All the best! so glad you started blogging. your photos just make me drool! Yummers! That cake looks amazing! Love the photos! Guess what? I had an idea. Reading your blog, as I do, I am constantly longing to make some of your recipes, but don't always find the time to do so. When I get the chance, I go back and look for particular ones to try. Only problem is, unless I know what the recipe is called and can do a google search, I have no way of finding the recipe I want. So, here's my idea. Do you think you could organize your recipes in a sidebar widget, like by ingredient, maybe? Then, when I have a certain ingredient, I can come on here and see what you've got. :) I LOVE YOUR BLOG! Happy birthday to Honey and Jam! I know how you feel; blogging has brought so much to my life that I'm thankful for, as well. I'm glad you're loving it so much. Happy blog birthday! Love all of your photos, and your cake is absolutely beautiful! Happy one year! :D Love your blog! happy belated blog-birthday! here's to another year of learning and inspiring! now that's what I call a perfectly nice and good birthday-anniversary cake. It looks so good. I wish I could eat from the screen. Congratulations to you for create this lovely blog and congrats to your family too for been so supportive. I adore your pictures too! Cake looks awesome, does the frosting recipe yield enough to fill the cake? This is awesome content mate, thank-you. find job in saudi arabia here.I simply wanted to thank you a lot more for your amazing website you have developed here.